REDDING, Calif. - Simpson University for Seniors will host an open house Aug. 22 for those interested in learning more about the monthlong, not-for-credit classes on topics including history, geography, art, music, and religion. The open house will be from 7 to 8:30 p.m. in the Simpson University dining center, 2211 College View Drive. Refreshments will be served. Guests can meet next year’s presenters as well as other students. 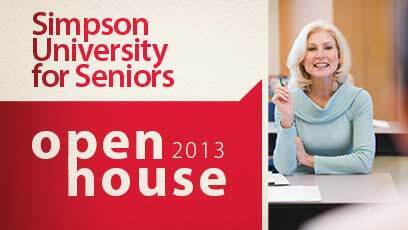 Attendees can RSVP at simpsonu.edu/openhouse or by calling (530) 226-4146. Simpson University for Seniors started in fall 2010 as a program geared to adults over 50 interested in classroom learning without required homework, tests or grades. Courses, held on Simpson University’s campus, are taught by university professors and professionals in their field of expertise. In response to growing inquiries from younger adults interested in the program, organizers have dropped the age recommendation for this year’s courses, which start Sept. 9. In addition, students who register for three classes in an academic year can take a fourth class for free. Other courses are scheduled for January, February, March, April, and May. It is the first year the program has been extended into May, bringing the total courses for the year to 16. All classes meet from 10:20 to 11:20 a.m. Mondays, Wednesdays and Fridays in the Owen Student Services Center (except for those offered in May). The cost is $95 per person, per course, or $145 per couple, per course. Register online at simpsonu.edu/seniorschool, or call (530) 226-4146.